A gastroscope is a long and slender medical instrument designed for the examination and surgical treatment of the stomach. It is a type of endoscope passed through the mouth to visualize the stomach. 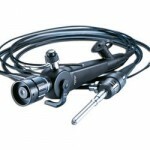 The major use of gastroscope is to perform esophagogastroduodenoscopy. This is fiber optic endoscopic, gastroenterology instrument, which is inserted through the mouth and used for the visual examination of the specifically the duodenum. 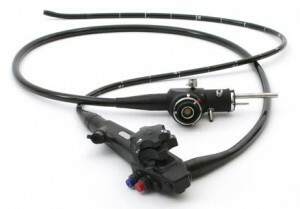 This equipment is used to perform ERCP (Endoscopic Retrograde Cholangiopancreatography). A colonoscope is a long flexible instrument the end of which is equipped with a device to obtain tissue samples. It is used for visual examination of the colon (colonoscopy) and getting samples if the diseased tissue for further investigation. As the name sounds, this is gastroenterology equipment used to visualize the small and the large intestines. It is used to perform a procedure known as Push Enteroscopy. This is vital equipment used in gastroenterology, It is an inflatable instrument introduced into certain gastrointestinal organs to dilate them for easy visualization and diagnosis of certain diseases. It is used to perform esophageal balloon dilatation, pyloric dilatation and/or ileocolonic dilatation. This is just a normal endoscope (a probe inserted into the alimentary canal) but with an ultrasound component on the lead. The ultrasonography images produced can be used in the diagnosis of the diseases of internal organs including the stomach, duodenum and the esophagus. It can also be used in the diagnosis of gastric cancer, esophageal cancer and pancreatic cancer. An endoscopic snare is gastroenterology instrument used in the removal of any foreign bodies within the alimentary canal. Most of such foreign bodies originate from the inside like excised polyps (in a procedure known as polypectomy). Hemorrhages occurring in the internal organs such as the stomach, the esophagus, the intestines and the pancreas can be difficult to control through the natural haemostatic processes. A heater probe is an instrument is used endoscopically and used for thermocoagulation of bleeding blood vessels. One of the major problems in the gastrointestinal system is variceal bleeding which may cause anemia of blood loss. A band ligator is a single-use sterile rubber band that is carefully placed at the base of the affected blood vessels. It is commonly used to perform variceal band ligation.